Hold on, folks—we’ve got a climber. A NASCAR fan just had to get that perfect view (like the other views, only more likely to get you killed) from on top of Charlotte Motor Speedway’s catch fence during this weekend’s Coca-Cola 600, and that went just about as well as you’d expect. It wasn’t until the security guard started pulling at our intrepid trackside mountaineer’s waistband when he finally got off the fence. Fans in the stands got their unobstructed view back, and the climber got a mondo wedgie. It’s worth noting that the consequences of scaling a catch fence are a bit more than just revealing to the world whether you’re a briefs or boxers guy. For one, the fan was immediately ejected from the race, reports Yahoo Sports. For another, if a crash had thrown cars up into that fence, the guy would have been mincemeat. There was no arrest record for Charlotte’s fence climber, per Yahoo, and it looks like he got off easy. 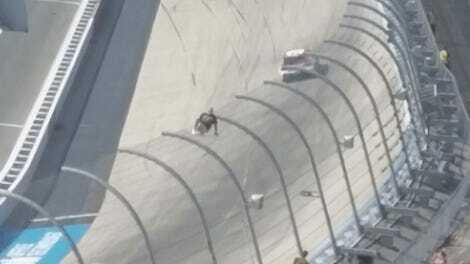 By contrast previously, a fan who climbed the catch fence at Richmond International Raceway during a 2014 NASCAR race was sentenced to jail time for his stunt.